Well another entertaining Plum Pudding meeting @ Mallory Park. Came away with some body work damage which appears to be the norm for this meeting. Had an interesting argument with a member of staff at the circuit for driving my car back from the scrutineers bay before the 0930 curfew. Scrutineering bay 200 yards from where the car was parked id pushed the car down there id be dead if i pushed it back again. 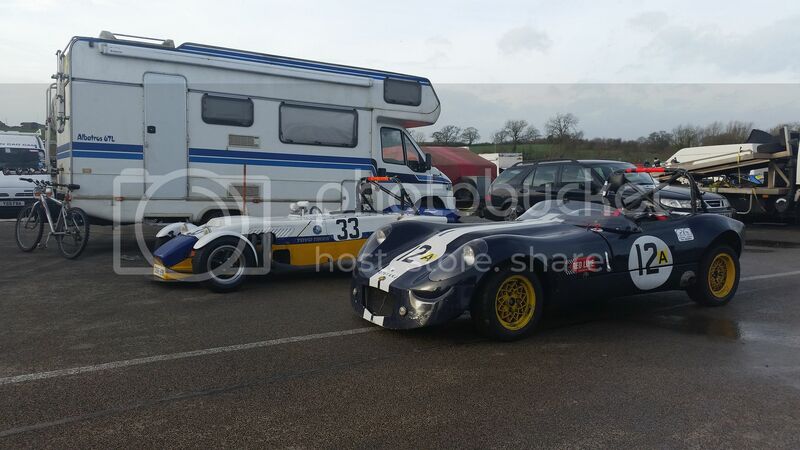 I understand that there is a noise curfew at Mallory so if the cars cant go to the scrutineers then they can come to the cars and check them they do this at Castle Combe. Moan over. Practice was fairly uneventful other than the throttle pedal snapping a few laps into practice and having to drive the car back to the pits on the kill switch as the throttle had failed and wedged itself fully on. My mate and fellow Kit Car Competitor ( Fletcher Hornet mk2) Billy broke out the Mig and welded the throttle back together using some bits of jubilee clip that he he cut up and we were back in action, We then took the car down to the weigh bridge and set the ride height after i had fitted my new Protech shocks again Billy was instrumental in doing this as i needed to be sat in the car. I need to redo the ride height after ive fitted the new Toyo 888r as i have elected to go for 205/60/13 on the rear. My Fury and Billy's Hornet keeping each other company. i was on grid position 13 now im quite superstitious i gave serious thought at this point to start from the back of the grid or the pitlane but decided to live with it. As the lights went out i had a cracking start as we entered Gerrards an MR2 tagged the back of an MX5 putting him into a spin he went to the inside of the track hit the barrier and then came back across the circuit nearly collecting yours truly and the Fury i had no choice but to turn left onto the grass. Unfortunately the Moles at Mallory park must be the size of Badgers ! the front edge of the Bonnet was torn off along with the bottom half of the radiator ducting. I rejoined penultimate last and was able to keep Billy and a battling pack of Caterhams in sight and found some laps i could close slightly (probably down to 8 seconds) but it was a very lonley race and i ended up finishing 13th. Sun was out and it was 13 degrees cant be bad. This was more like it on the third row on the outside of the grid just where i like to be and certainly the car with the most straight line squirt all the quick boys were further back (due to the reverse grid) so here was a chance to lead the race even for a lap. Again another good start got me into second and on the exit of Gerrards i passed an MX5 to go into first place for about 20 yards before a kawasaki engined 7 came screaming past on the stebe straight and thats how it was the quick boys all came past within a couple of laps ad i was being chased down by a gaggle of well driven Caterhams then on the exit of Gerrards i saw the familiar flash of orange Day glo in the rear view mirror which meant one thing that Fletcher was now on me and going extremely well. Now the Fury is a quick car and the power was helping me just keep the Caterhams at bay. Billy went by and i managed to chase him and nearly repassed him on the start finish straight but he outbraked me held the line and ny the time we exited Gerrards he was 200 yards ahead. 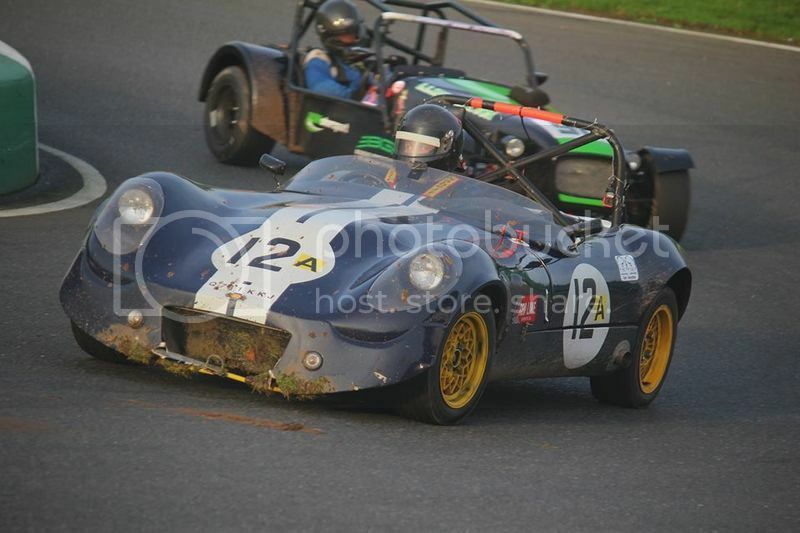 I was driving hard and just managing to keep the Caterhams behind me. As the Go pro has proved i was shown the chequered flag lifted off and was even waving at the Marshalls at this point the Caterhams i had been racing with came past still at race pace then a backmarker re overtook. The penny dropped that it had been a mistake si i had to get back on it. One of The Caterhams spun at the essses and the two 1400 Mks had come together at the hairpin i just went for but must admit to feeling a little relief when the chequered flag came out for real. A good days racing i just need to alter a few things on the fury to make it more comfortable then its just seat time to gain confidence. Nice write-up. Looks like lots of fun. Cheers Jeff it was great fun although the Plum Pud is always a little nerve racking.